Whaley Bridge people are being invited by the local branch of the Royal British Legion to attend a candle vigil, between 10pm-11pm at the Cenotaph in Memorial park on Monday 4 August, the centenary of the start of World War I. “The lamps are going out all over Europe, we shall not see them lit again in our lifetime.” Words spoken by Sir Edward Grey, Foreign Secretary in August 1914. Everyone in the UK is invited to take part in LIGHTS OUT by turning off their lights from 10pm to 11pm on Monday, August 4– leaving only a single light or candle for this symbolic act of reflection and hope, to mark the 100th Anniversary of the date Great Britain entered the First World War. You can take part in this national moment of reflection at the newly refurbished Cenotaph in Whaley Bridge Memorial Park. Members of the Royal British Legion will be holding a candle-lit vigil around the Cenotaph to mark the Centenary between 10pm and 11pm on 4 August 2014. 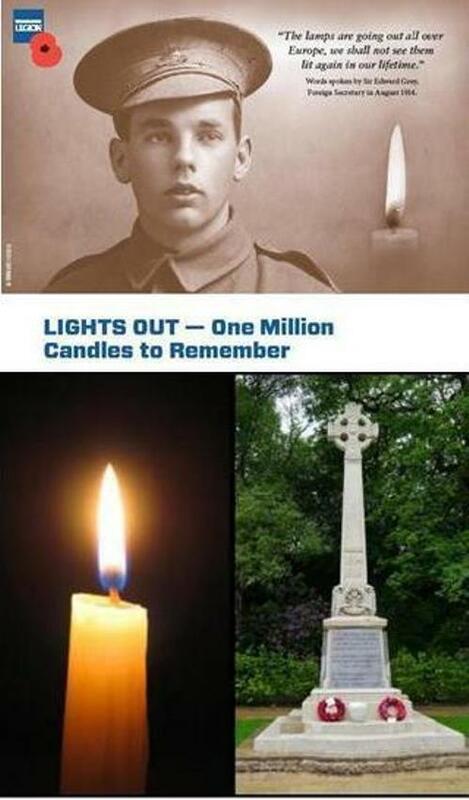 You can bring your own candle or a special Centenary Candle, available from your local Marks and Spencer. All profits from the sale of Centenary Candles will support serving members of the Armed Forces, veterans of all ages and their families. Come and join the event at the Memorial Park in Whaley Bridge and pay your respects to all those who sacrificed their lives during this conflict. Candles will be lit and extinguished at 11pm. People are asked to bring a candle or torch. Earlier in the evening, there will be another commemoration of the centenary. Muffled bells for mourning will ring out from St James’, Taxal, from 7pm. USERS of Whaley Bridge’s Memorial Park are mystified by the sudden flowering of red poppies on a grassy bank in front of the Cenotaph, only days before the centenary of the start of World War I. The distinctive white Cenotaph was controversially unavailable for Remembrance Day services last year and in 2012, because of extensive work in the park. After restoration, it was rededicated in May. A few scattered red poppies were first noticed in mid-July. Since then, they have increased, to the amazement of walkers in the park. Local people have asked Paul not to cut the grass until the poppy flowering season is over. Regular users of the park say they have never seen poppies there before. The park was given to the people of Whaley Bridge in the 1920s by the Jodrell family, local landowners. My Grandad Wilfred Fox joined WW1 in 1916 and is buried at Taxal.